Superheroes may save the world, but parenthood requires skills far more advanced than extendable limbs. 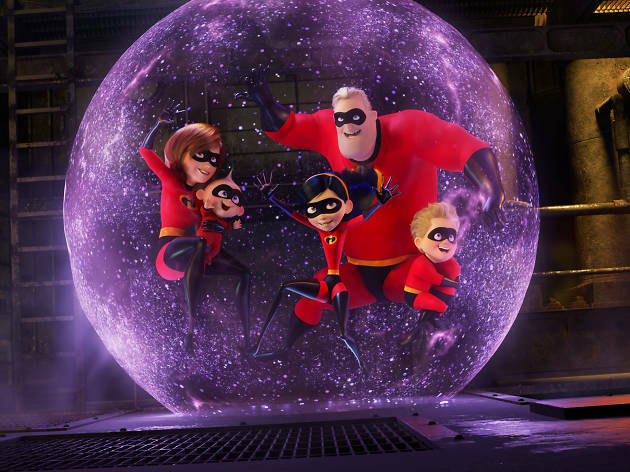 Brad Bird’s Incredibles 2—Pixar’s most spirited sequel since Toy Story 3—lovingly expresses this certainty through a bighearted familial portrait wrapped in ’60s-inspired design. But the film’s disarming appeal lies in its simpler moments of domesticity, in which the members of the all-superhero Parr family lift each other up and fight for relevance in a world of indifference. Still underground with criminalized superpowers and a destroyed home, Mr. 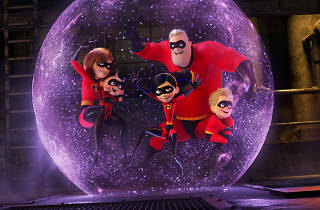 Incredible (Craig T. Nelson), Elastigirl (Holly Hunter), and their children, Violet, Dash and the explosive baby Jack-Jack, quietly live in a dingy motel. Their luck turns when a pair of wealthy siblings—the naive Winston and brainy inventor Evelyn (Bob Odenkirk and Catherine Keener)—offer them a chance to restore the Supers’ reputation. While the sensible Elastigirl serves as the fearless face of the mission, Mr. Incredible hilariously Mr. Moms his way through the kids’ homework, boy troubles and newly emerging superpowers. When the state-of-the-art villain Screenslaver disturbs the picture, the entire crew, including the previous film’s charismatic ice maker Frozone (Samuel L. Jackson), joins the good fight. Incredibles 2 comes supercharged with timely, sophisticated themes around societal apathy and gender parity. While slightly overplotted in its finale, the sleek sequel still glows with grown-up wit, with craft and humor to match franchises like James Bondand Mission Impossible. At a time when movie screens are clogged with indistinguishable superheroes in obnoxious crossover events, Incredibles 2 kicks it old school and rises above the noise with its defiantly humane soul. You could spot the twist a mile away but it was fast-moving fun and still the standard-bearer for superhero movies. That said, there’s room for the Marvel movies and Nolan’s Batman trilogy.